La Pierre Verte welcomes you to an oasis of peace and quiet right in the heart of the Provence-Alpes-Cote d'Azur region. With its ideal location and great range of facilities, this luxury camping site appeals to camping enthusiasts looking to experience something different in a unique natural environment. Let the luxury camping specialists at LUX-camp take care of every detail and treat yourself to a fantastic camping holiday in France. This region is blessed with perfect holiday weather: enjoy balmy temperatures between April and October along with up to 13 hours of glorious sunshine every day. La Pierre Verte has a perfect location only 11 kilometres away from the splendid beaches of the Cote d'Azur and approximately 1 hour away from glitzy Saint Tropez. There are 10 luxurious accommodation options to choose from. Comfort, privacy, and a peaceful location are guaranteed! An on-site water park that will keep adults and children entertained with its pools, toboggans, and jacuzzi areas. At La Pierre Verte, you won't miss any of the comforts of your own home. Every accommodation option at this 4-star campsite has been designed to offer a luxury camping experience. Book a stay in a modern and beautifully decorated mobile home and enjoy ample living space, both indoors and outdoors. The mobile home units at La Pierre Verte range from 21m2 to 30m2 and can accommodate up to 7 people. La Pierre Verte offers a wide range of activities that suit the interests of every age group. Enjoy some quality time with the family and make the most of all the activities on offer at this campsite. Volleyball, tennis, archery, aquagym, and cycling are just a few of the options available. The evenings are also filled with fun thanks to interesting events, open-air concerts, dance competitions, etc. Nestled between the sea and the mountains, Provence-Alpes-Cote d'Azur is a natural paradise just waiting to be explored. La Pierre Verte is ideally situated for day trips to glamorous coastal resorts like Cannes, Monaco, Antibes, and Nice. For something different but just as exciting, visit the beautiful Verdon Gorge, which is home to impressive canyons, mountain scenery, and alpine lakes. 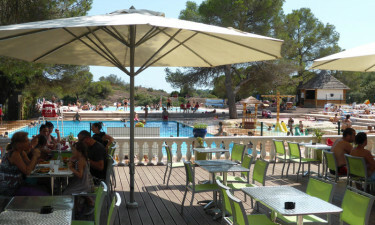 Also within easy reach of La Pierre Verte, you will find family-friendly attractions like the zoo at Frejus or Aqualand. A restaurant serving the best of French and European cuisine and a poolside snack bar are open throughout the day for your convenience. Meals are prepared by an experienced chef and take-away options are also available. 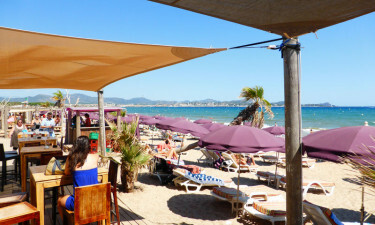 You can also find Michelin-starred restaurants a few kilometres away in Frejus and Saint-Raphael. A convenience store is open to all guests and stocks holiday essentials, newspapers, freshly baked bread, and quality groceries. Boutiques, supermarkets, and souvenir shops are only a short drive away in Frejus town centre.